After securing #1 Rank in LBank & ABCC Transcodium is now going to participate in the Bitmart voting competition. 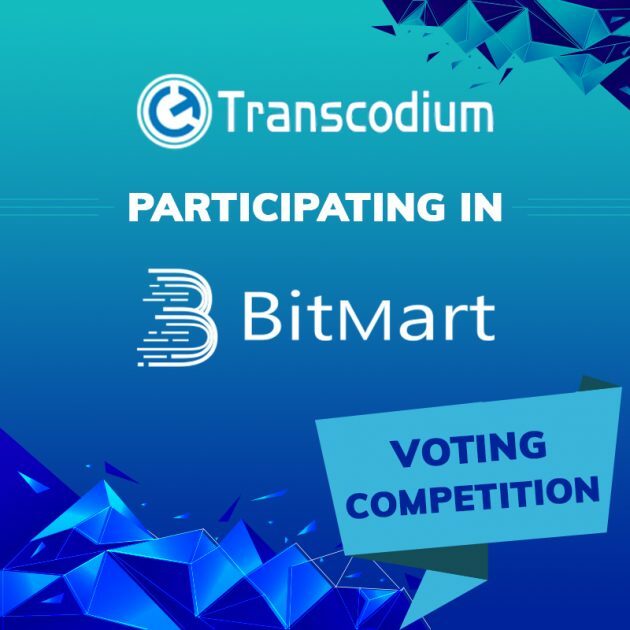 Bitmart has already shortlisted and announced the participation of Transcodium in the voting competition which is going to start on 16th of November. The rules for voting are simple and similar to previous voting competitions, below you can read about the rules and prepare for it prior to the voting competition. Bitmart users can use the voting system on ATP to participate in the voting campaign. Every day each user will have 1 free vote. Users can also use BMX to vote ( 1 BMX = 1vote). up to 50 votes per day. So each user can vote a total of 51 votes ( 1 free vote + 50 paid votes ) each day. Projects are ranked based on the principle of “Number of Votes First, Number of Voters First, Time First” When the number of votes is the same, the project with the higher number of voters will win, e.t.c. After the voting is over, BitMart will not return any of the BMX earned from the winning project. Those BMX will be used as a marketing promotion fees for listing on Bitmart. After the voting is over, the BMX voted for those unlisted projects will be returned to users accounts within 3 working days. When the voting is over, the ATP voting system will analyze and investigate all the data. After ensuring the data is accurate, Bitmart will publish the listing announcement for the winning project.